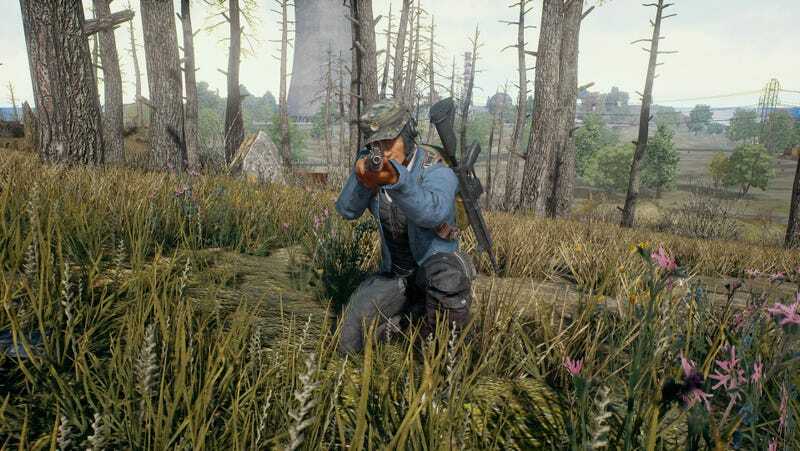 PlayerUnknown’s Battlegrounds is the title of Steam’s latest million-seller. It’s also a damn mouthful. So, why call it that? Who, or what (or when???) is PlayerUnknown? PlayerUnknown is not, as some people seem to think, the game’s development studio, nor is he a character in the game. Instead, it’s the handle of one person: modder-turned-game-developer Brendan Greene. Greene’s not a one-man wunderkind, though. He developed PUBG in conjunction with Korean studio Bluehole, who you might know for their work on surprisingly good action-MMO TERA. Greene’s handle is in the title because he invented the whole dang battle royale genre—or at least, he played a huge role in pioneering it. He began in military sim Arma 2, which at the time had gained a surprise popularity boost thanks to the success of the-greatest-zombie-of-all-is-man sandbox DayZ. Inspired by Japanese book and film Battle Royale, Greene modded DayZ into a proto version of the 100+-person deathmatch seen in games like H1Z1: King of the Kill and PUBG. When people began to move on from DayZ and Arma 2, Greene switched to Arma 3, polishing his idea and creating what’s generally regarded as the most tactical and methodical entry in the genre. By that point, the battle royale genre had begun to pick up popularity of its own, so Sony Online Entertainment (now Daybreak) brought Greene on to consult in the creation of their own battle royale mode, which eventually become standalone game H1Z1: King of the Kill. King of the Kill is more arcade-y than Greene’s mods, but it still wears its structural heritage on its sleeve. So yes, Greene had a direct and deliberate hand in creating both titans of the burgeoning genre. Not a bad spot to find yourself in, all things considered. Now he gets to watch his brainchildren duke it out with their beefy brainfists, but he insists that they’re not trying to kill each other, despite the narrative many fans have built around them.